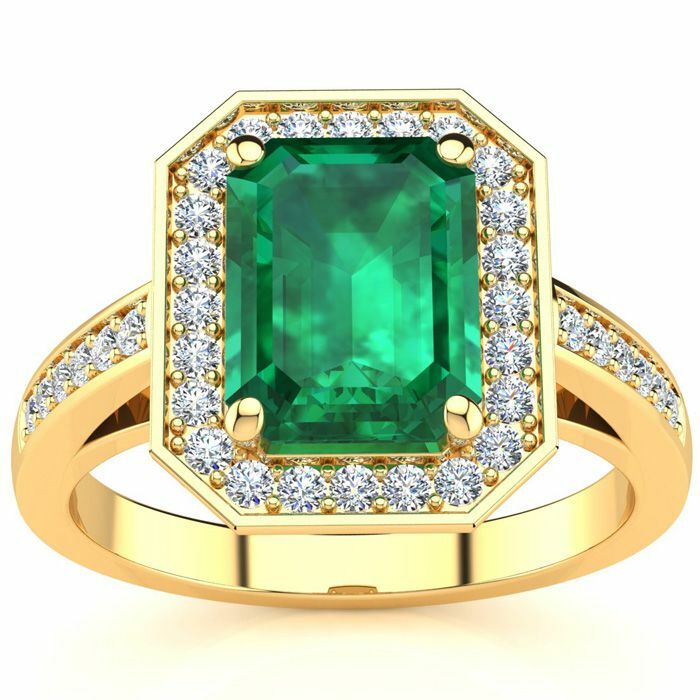 This stunning gemstone and halo diamond ring features one 7x5mm emerald shape emerald gemstone at 0.90 carats. It is surrounded by 40 sparkling diamonds in a halo and down the band in I-J color, SI2-I1 clarity at 0.22 carats. Total gem weight is 1.11 carats. This ring is crafted in 14 karat yellow gold. 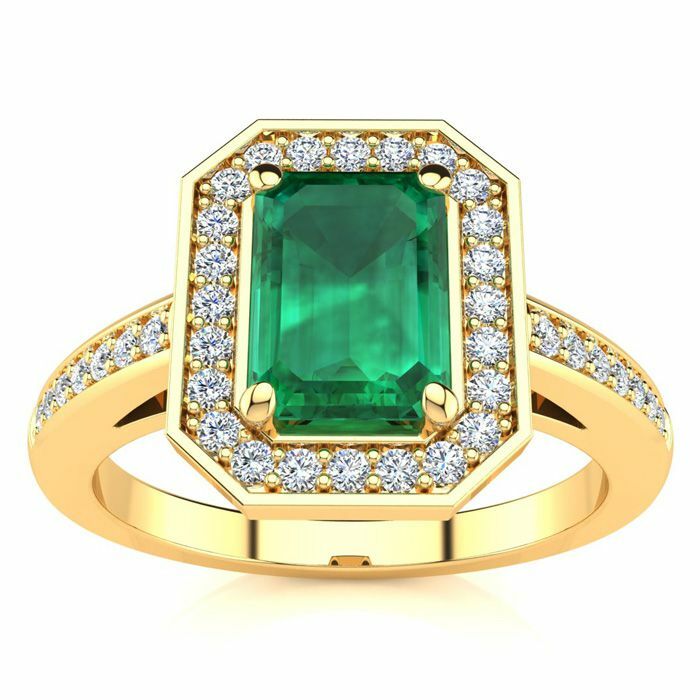 This stunning gemstone and halo diamond ring features one 8x6mm emerald shape emerald gemstone at 1.40 carats. It is surrounded by 38 sparkling diamonds in a halo and down the band in I-J color, SI2-I1 clarity at 0.39 carats. Total gem weight is 1.79 carats. This ring is crafted in 14 karat yellow gold. 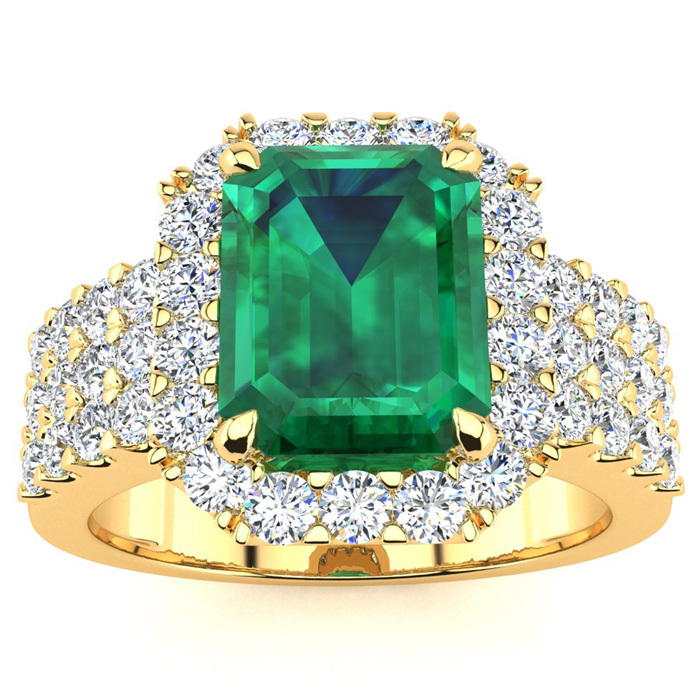 This stunning gemstone and halo diamond ring features one 9x7mm emerald shape emerald gemstone at 2.15 carats. It is surrounded by 42 sparkling diamonds in a halo and down the band in I-J color, SI2-I1 clarity at 0.43 carats. Total gem weight is 2.58 carats. This ring is crafted in 14 karat yellow gold. 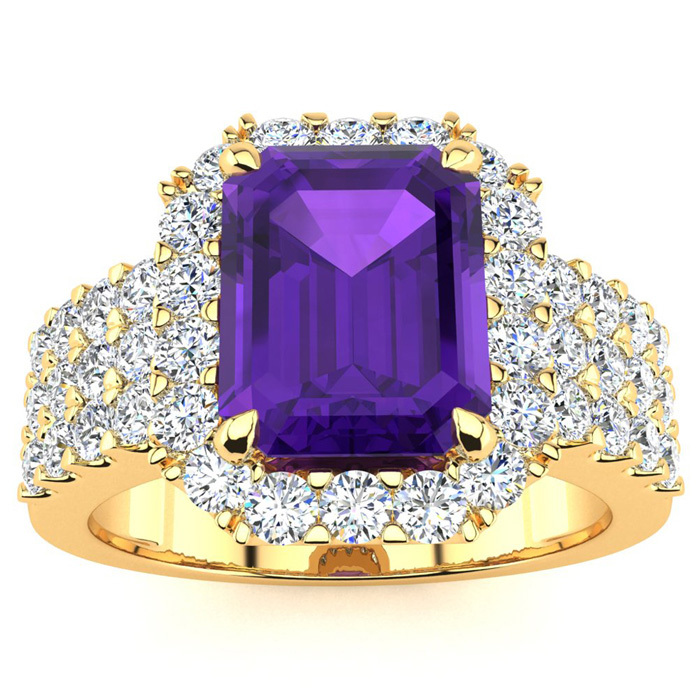 This stunning gemstone and diamond ring features one 9x7mm emerald shape amethyst gemstone at 2.00 carats. It is surrounded by 42 sparkling diamonds in a halo and down the band in I-J color, I1-I2 clarity at 0.95 carats. Total gem weight is 2.95 carats. This ring is crafted in 14 karat yellow gold. 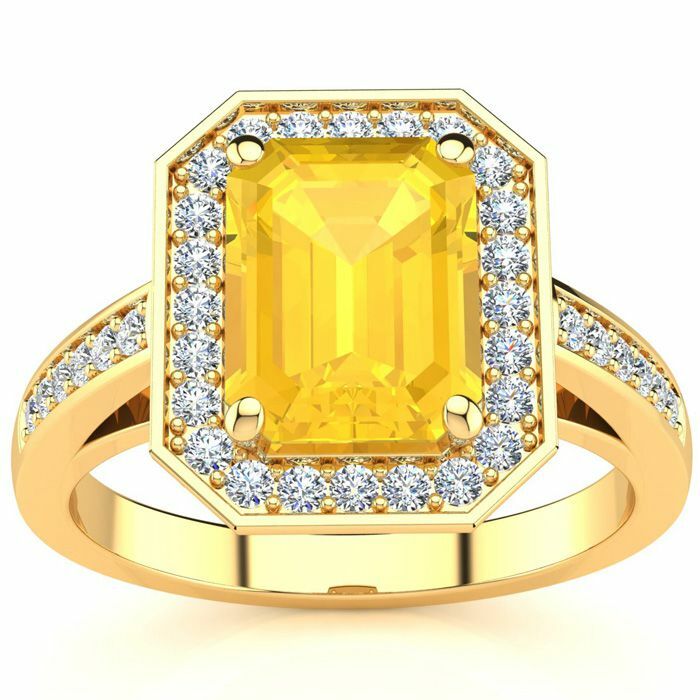 This stunning gemstone and diamond ring features one 9x7mm emerald shape citrine gemstone at 2.00 carats. It is surrounded by 42 sparkling diamonds in a halo and down the band in I-J color, I1-I2 clarity at 0.95 carats. Total gem weight is 2.95 carats. This ring is crafted in 14 karat yellow gold. 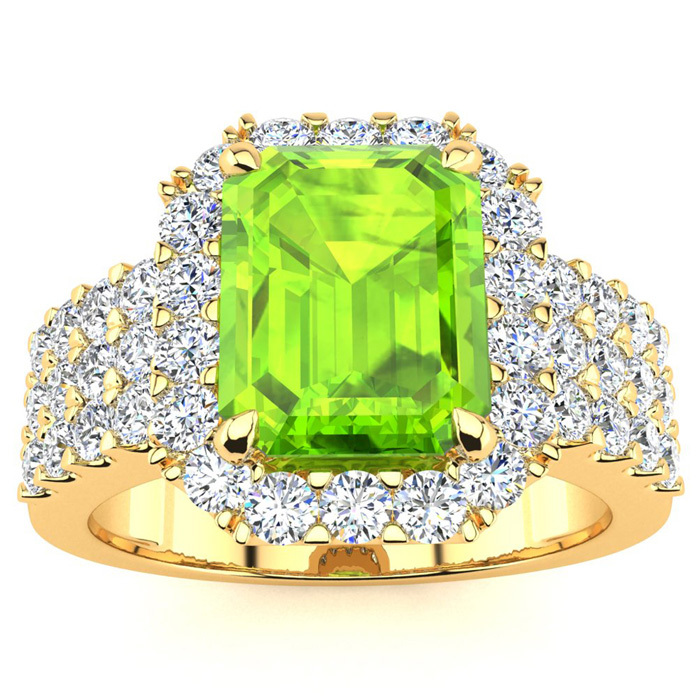 This stunning gemstone and diamond ring features one 9x7mm emerald shape peridot gemstone at 2.50 carats. It is surrounded by 42 sparkling diamonds in a halo and down the band in I-J color, I1-I2 clarity at 0.95 carats. Total gem weight is 3.45 carats. This ring is crafted in 14 karat yellow gold. 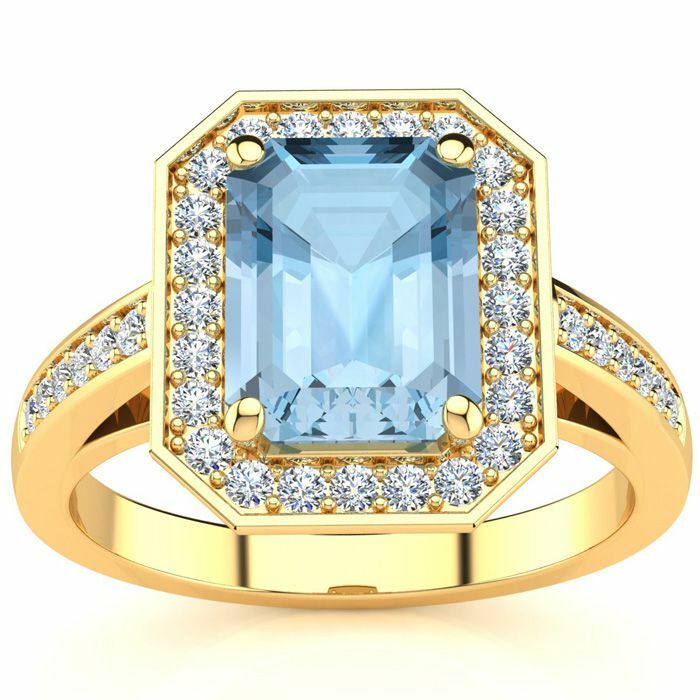 This stunning gemstone and diamond ring features one 9x7mm emerald shape aquamarine gemstone at 2.15 carats. It is surrounded by 42 sparkling diamonds in a halo and down the band in I-J color, I1-I2 clarity at 0.95 carats. Total gem weight is 3.10 carats. This ring is crafted in 14 karat yellow gold. This stunning gemstone and diamond ring features one 9x7mm emerald shape tanzanite gemstone at 2.45 carats. It is surrounded by 42 sparkling diamonds in a halo and down the band in I-J color, I1-I2 clarity at 0.95 carats. Total gem weight is 3.40 carats. This ring is crafted in 14 karat yellow gold. 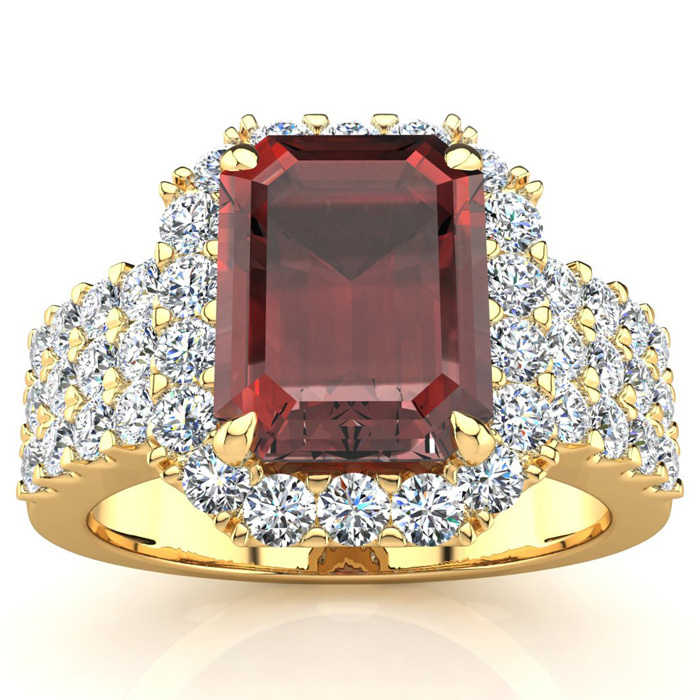 This stunning gemstone and diamond ring features one 9x7mm emerald shape garnet gemstone at 2.75 carats. It is surrounded by 42 sparkling diamonds in a halo and down the band in I-J color, I1-I2 clarity at 0.95 carats. Total gem weight is 3.70 carats. This ring is crafted in 14 karat yellow gold. This stunning gemstone and diamond ring features one 9x7mm emerald shape ruby gemstone at 2.90 carats. It is surrounded by 42 sparkling diamonds in a halo and down the band in I-J color, I1-I2 clarity at 0.95 carats. Total gem weight is 3.85 carats. This ring is crafted in 14 karat yellow gold. 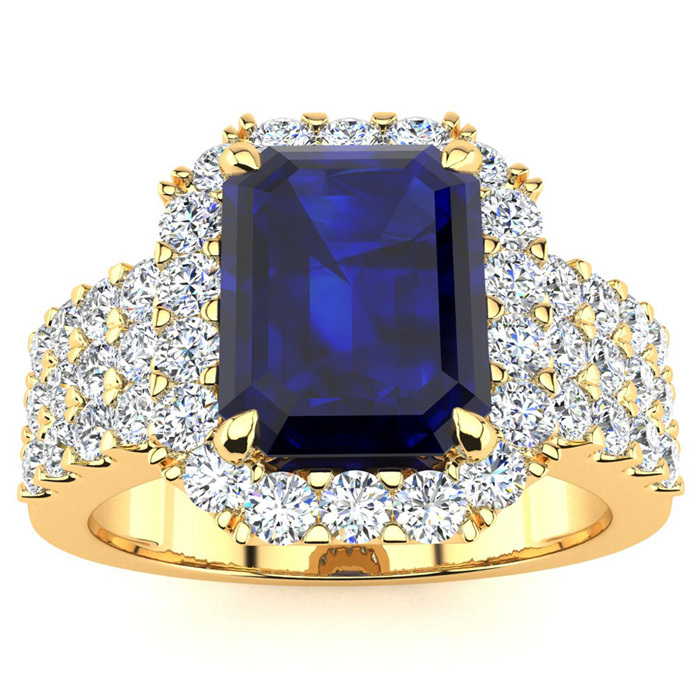 This stunning gemstone and diamond ring features one 9x7mm emerald shape sapphire gemstone at 2.90 carats. It is surrounded by 42 sparkling diamonds in a halo and down the band in I-J color, I1-I2 clarity at 0.95 carats. Total gem weight is 3.85 carats. This ring is crafted in 14 karat yellow gold. 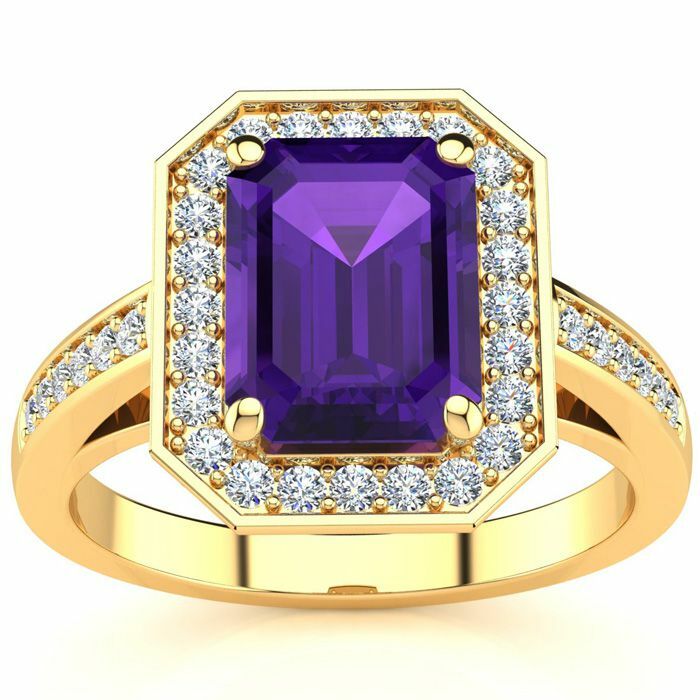 This stunning gemstone and halo diamond ring features one 7x5mm emerald shape amethyst gemstone at 0.90 carats. It is surrounded by 40 sparkling diamonds in a halo and down the band in I-J color, SI2-I1 clarity at 0.22 carats. Total gem weight is 1.11 carats. This ring is crafted in 14 karat yellow gold. 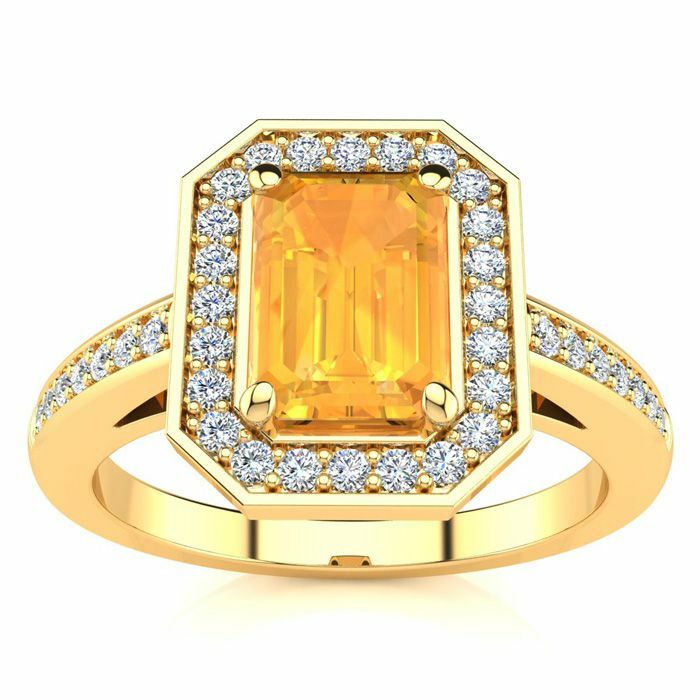 This stunning gemstone and halo diamond ring features one 7x5mm emerald shape citrine gemstone at 0.90 carats. It is surrounded by 40 sparkling diamonds in a halo and down the band in I-J color, SI2-I1 clarity at 0.22 carats. Total gem weight is 1.11 carats. This ring is crafted in 14 karat yellow gold. 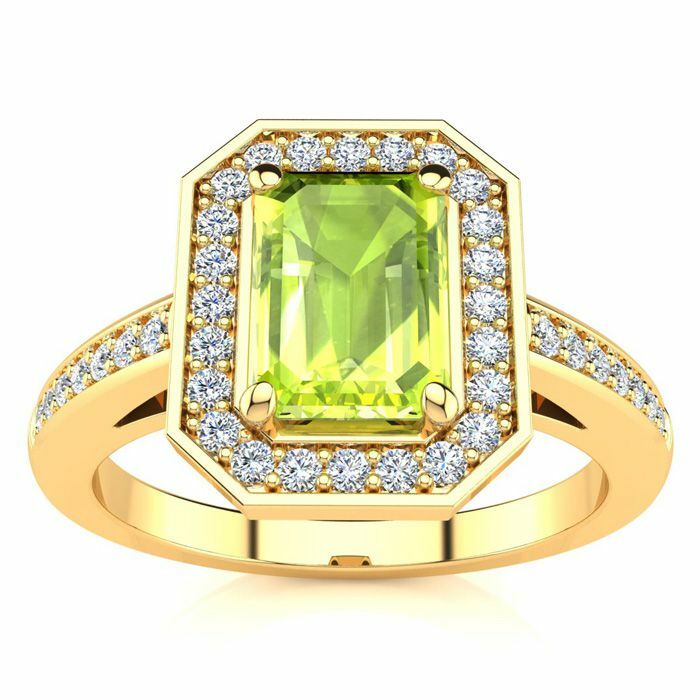 This stunning gemstone and halo diamond ring features one 7x5mm emerald shape peridot gemstone at 1.15 carats. It is surrounded by 40 sparkling diamonds in a halo and down the band in I-J color, SI2-I1 clarity at 0.22 carats. Total gem weight is 1.36 carats. This ring is crafted in 14 karat yellow gold. 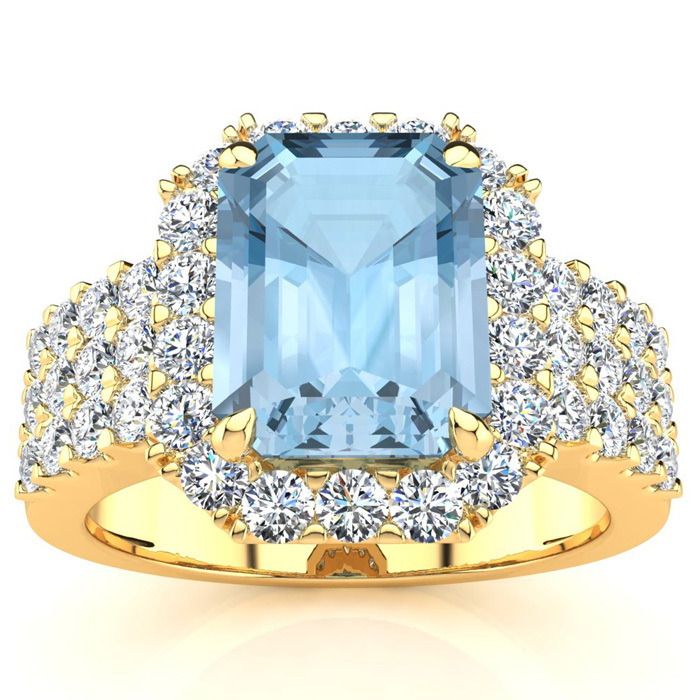 This stunning gemstone and halo diamond ring features one 7x5mm emerald shape aquamarine gemstone at 0.90 carats. It is surrounded by 40 sparkling diamonds in a halo and down the band in I-J color, SI2-I1 clarity at 0.22 carats. Total gem weight is 1.11 carats. This ring is crafted in 14 karat yellow gold. 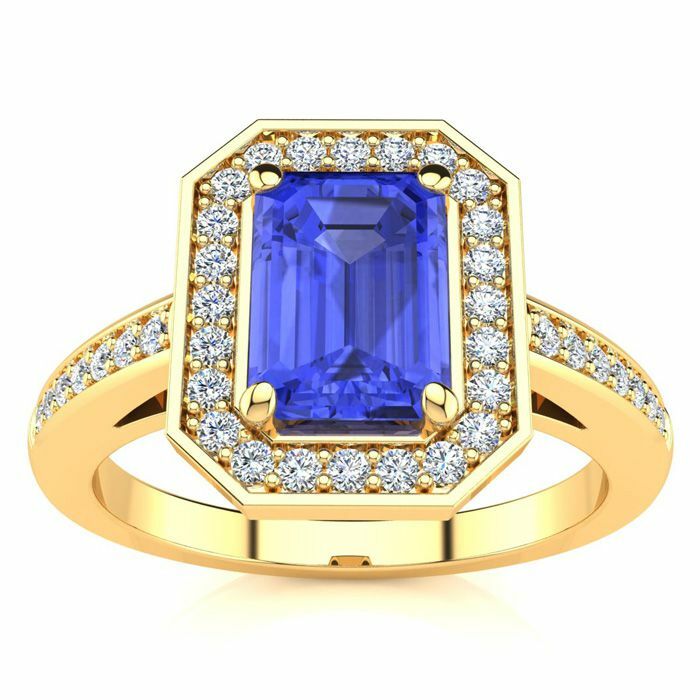 This stunning gemstone and halo diamond ring features one 7x5mm emerald shape tanzanite gemstone at 1.15 carats. It is surrounded by 40 sparkling diamonds in a halo and down the band in I-J color, SI2-I1 clarity at 0.22 carats. Total gem weight is 1.36 carats. This ring is crafted in 14 karat yellow gold. This stunning gemstone and halo diamond ring features one 7x5mm emerald shape garnet gemstone at 1.30 carats. It is surrounded by 40 sparkling diamonds in a halo and down the band in I-J color, SI2-I1 clarity at 0.22 carats. Total gem weight is 1.51 carats. This ring is crafted in 14 karat yellow gold. 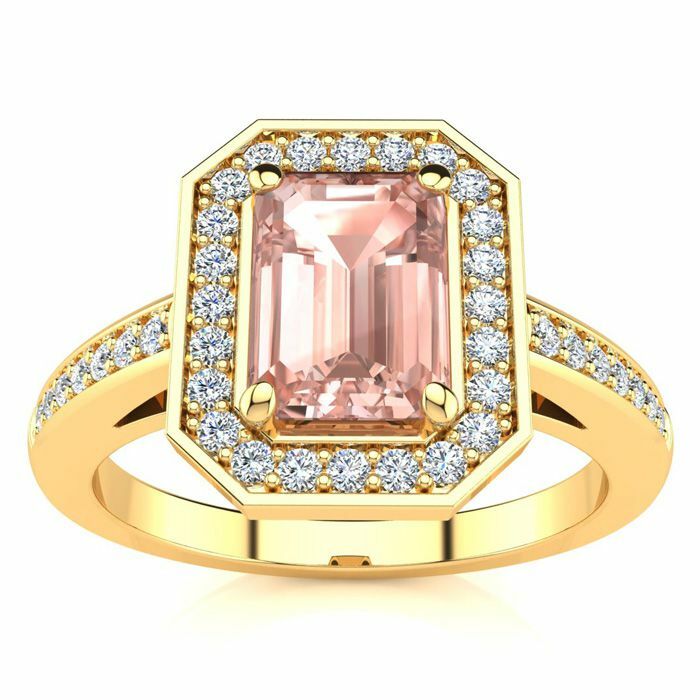 This stunning gemstone and halo diamond ring features one 7x5mm emerald shape morganite gemstone at 0.90 carats. It is surrounded by 40 sparkling diamonds in a halo and down the band in I-J color, SI2-I1 clarity at 0.22 carats. Total gem weight is 1.11 carats. This ring is crafted in 14 karat yellow gold. This stunning gemstone and halo diamond ring features one 7x5mm emerald shape ruby gemstone at 1.00 carats. It is surrounded by 40 sparkling diamonds in a halo and down the band in I-J color, SI2-I1 clarity at 0.22 carats. Total gem weight is 1.21 carats. This ring is crafted in 14 karat yellow gold. 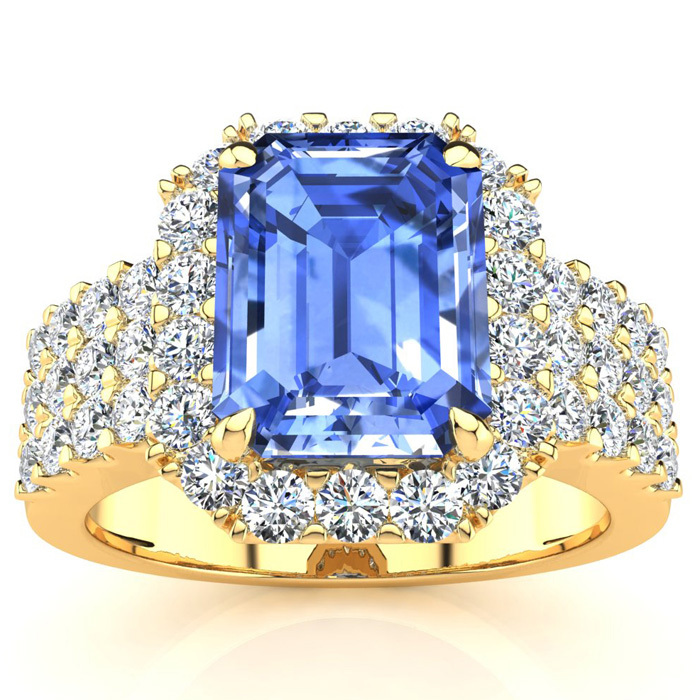 This stunning gemstone and halo diamond ring features one 7x5mm emerald shape sapphire gemstone at 1.15 carats. It is surrounded by 40 sparkling diamonds in a halo and down the band in I-J color, SI2-I1 clarity at 0.22 carats. Total gem weight is 1.36 carats. This ring is crafted in 14 karat yellow gold. 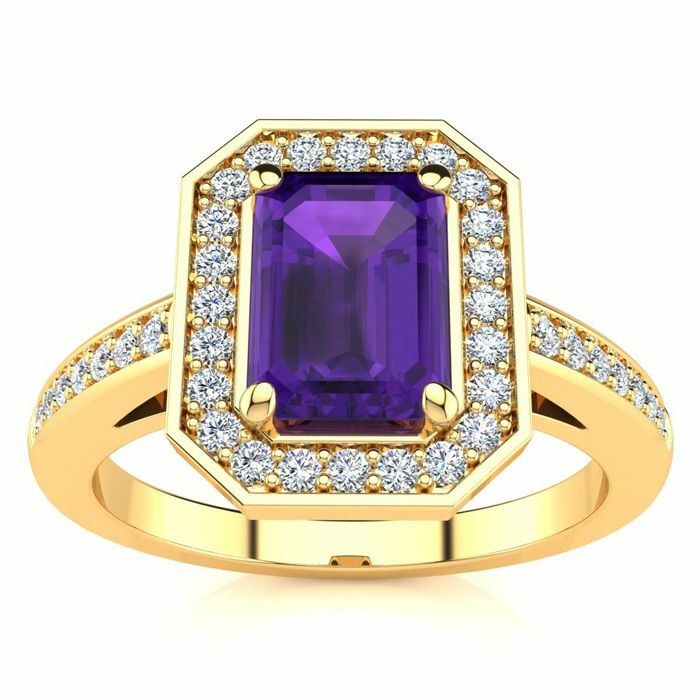 This stunning gemstone and halo diamond ring features one 8x6mm emerald shape amethyst gemstone at 1.50 carats. It is surrounded by 38 sparkling diamonds in a halo and down the band in I-J color, SI2-I1 clarity at 0.39 carats. Total gem weight is 1.89 carats. This ring is crafted in 14 karat yellow gold. 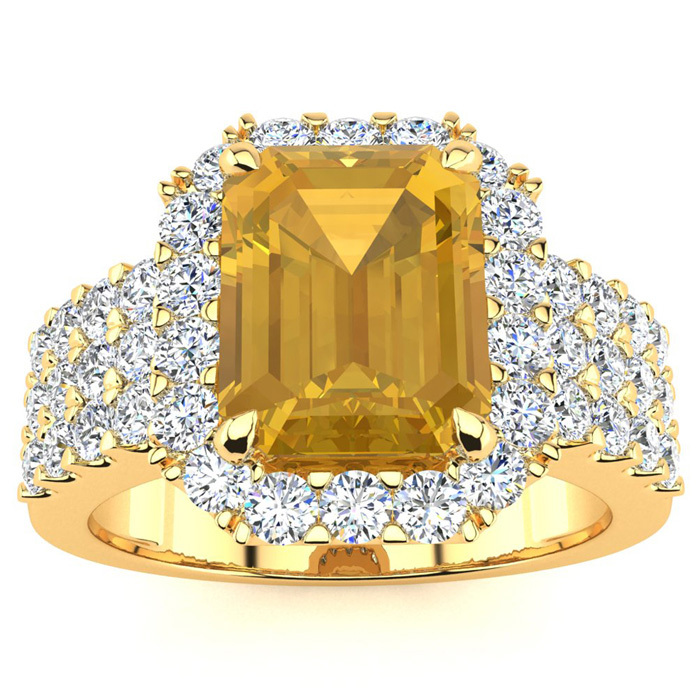 This stunning gemstone and halo diamond ring features one 8x6mm emerald shape citrine gemstone at 1.50 carats. It is surrounded by 38 sparkling diamonds in a halo and down the band in I-J color, SI2-I1 clarity at 0.39 carats. Total gem weight is 1.89 carats. This ring is crafted in 14 karat yellow gold. 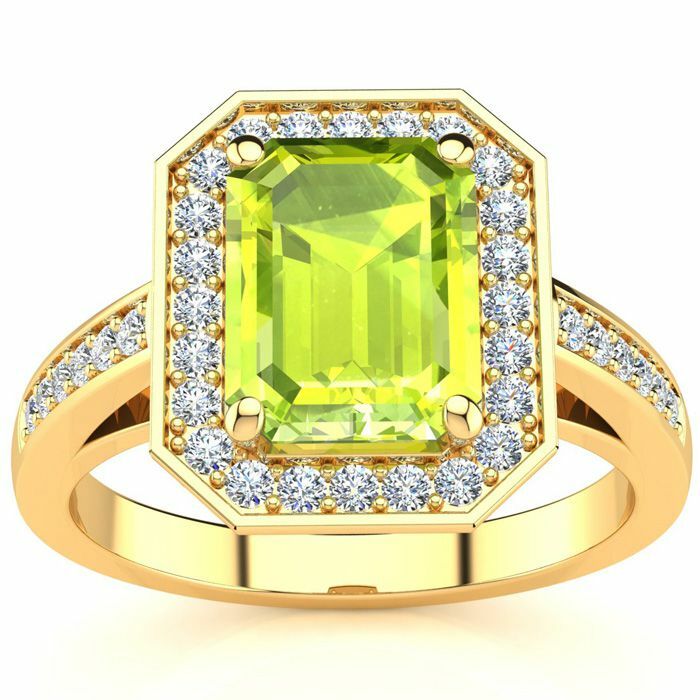 This stunning gemstone and halo diamond ring features one 8x6mm emerald shape peridot gemstone at 1.75 carats. It is surrounded by 38 sparkling diamonds in a halo and down the band in I-J color, SI2-I1 clarity at 0.39 carats. Total gem weight is 2.14 carats. This ring is crafted in 14 karat yellow gold. 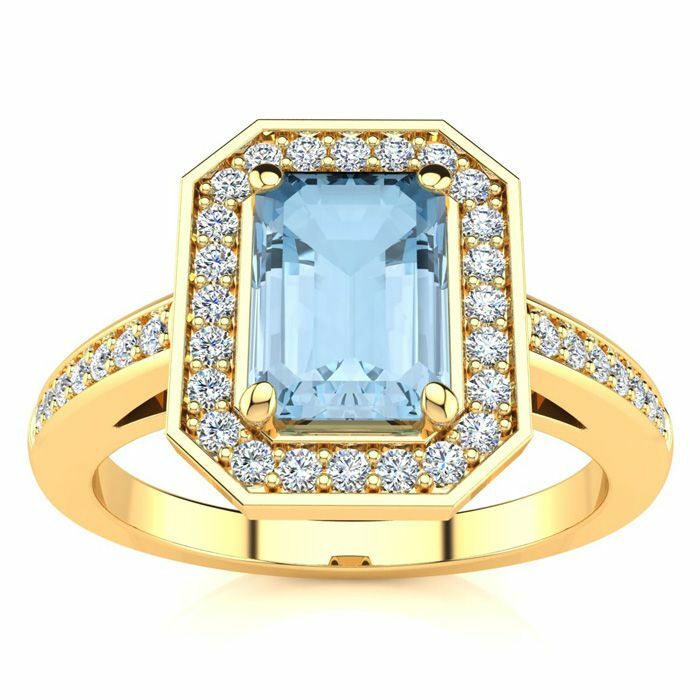 This stunning gemstone and halo diamond ring features one 8x6mm emerald shape aquamarine gemstone at 1.40 carats. It is surrounded by 38 sparkling diamonds in a halo and down the band in I-J color, SI2-I1 clarity at 0.39 carats. Total gem weight is 1.79 carats. This ring is crafted in 14 karat yellow gold.